'Education is a right not a privilege' was one of the main slogans of the tens of thousands of students who protested in 2010, writes Claire Laker-Mansfield, Socialist Students national organiser. Introducing university tuition fees was one of New Labour's first acts in government. Proving their pro-big business and pro-market agenda, they followed up by introducing top-up fees of up to £3,000 a year. But students who are struggling and facing a lifetime of debt must not accept this. 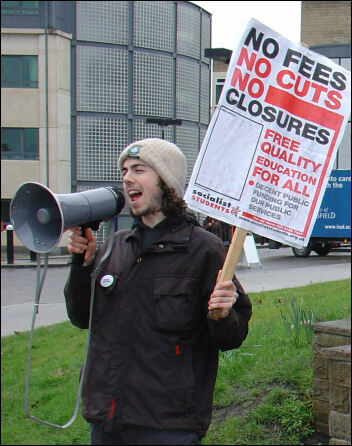 Socialist Students national organiser MATT DOBSON looks at the situation and outlines a programme for fighting for free education. THE LIES go on! Blair maintains that the introduction of top-up fees has been vindicated and that his critics have been proved wrong. As usual his claims are based on dodgy evidence.